Hyperthyroidism is a medical condition that results from an excess of thyroid hormone in the blood. Thyroid hormones control most metabolic processes in the body. 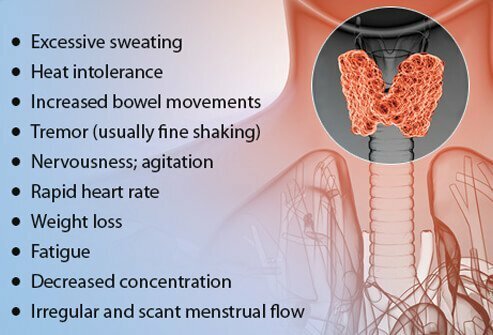 In cases of hyperthyroidism, these processes are often sped up causing symptoms of hyperthyroidism, which will be discussed later in this slide show. Thyrotoxicosis is an extreme version of hyperthyroidism that can cause severe or life-threatening symptoms. Thyroid hormones control most metabolic processes in the body. They are produced by the thyroid gland located in the anterior (front) part of the neck. These hormones affect many organs and biochemical systems in your body. Complex biochemical processes in the body control the thyroid gland's production of thyroid hormones. Two other glands – the hypothalamus and the pituitary gland – both have a biochemical effect on the thyroid. The hypothalamus (the "master gland") releases a hormone called thyrotropin-releasing hormone (TRH), which sends a signal to the pituitary to release thyroid-stimulating hormone (TSH). 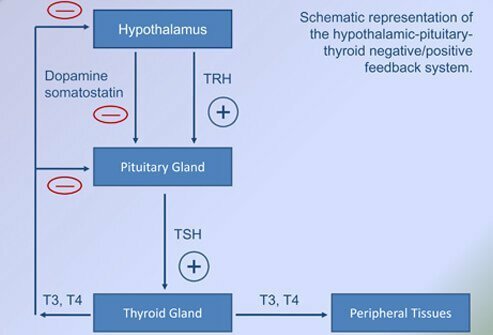 In turn, TSH sends a signal to the thyroid to release thyroid hormones. A problem with any of these three glands may cause an over-production of thyroid hormone and can cause hyperthyroidism. The most common cause of hyperthyroidism is Graves' disease. The thyroid gland itself over-produces thyroid hormone and is no longer able to respond to the pituitary and hypothalamus. Graves' disease is five times more common in women and runs in families. Risk factors for Graves' disease include smoking, viral illnesses, radiation to the neck, and medications. 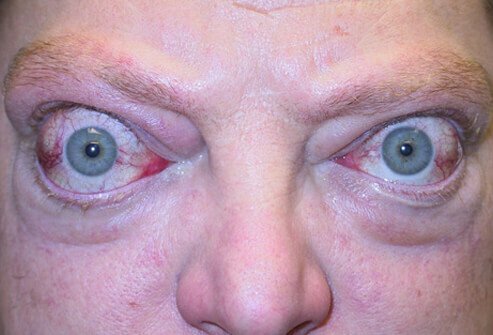 The condition is associated with an eye disease called Graves' ophthalmopathy and skin lesions called dermopathy. 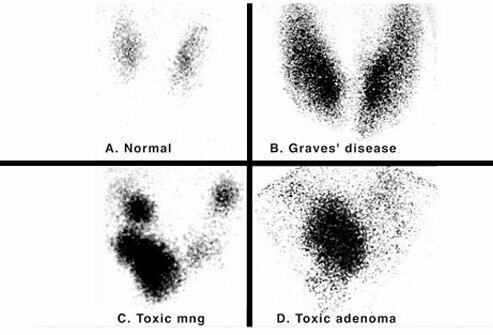 Diagnosis of Graves' disease is made by blood tests, and a nuclear medicine thyroid scan. When the thyroid gland tissue overgrows, either in individual nodules (the functioning adenoma) or in multiple clusters (multinodular goiter), it is generally termed a "goiter." Goiters appear as large, swollen areas in the front of the neck near the Adam's apple. These goiters may over-produce thyroid hormone, causing symptoms of hyperthyroidism. Hyperthyroidism may be caused by the intake of too much thyroid medication. 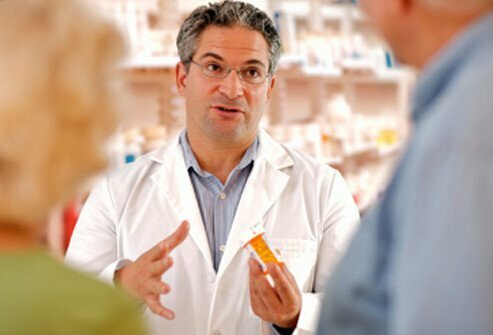 Supplemental thyroid medication is given to patients who have low thyroid hormone, or hypothyroidism. If the dose is not correct or the patient takes too much of the medication, hypothyroidism may occur. Some people may abuse thyroid hormone medications in an attempt to lose weight. Taking thyroid hormones the body does not need may result in hyperthyroidism. Thyroid-stimulating hormone (TSH) is secreted by the pituitary gland and causes the thyroid gland to produce thyroid hormone. 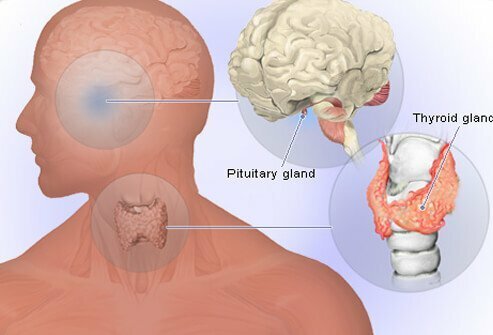 A tumor or problem with the pituitary gland can cause and excess of TSH to affect the thyroid, and can result in hyperthyroidism. Thyroiditis is inflammation of the thyroid. It is usually caused by a viral illness. The patient may have generalized neck pain, sore throat, fever, chills, and a tender thyroid. The inflammation of the thyroid causes an increased amount of thyroid hormone to be secreted into the body, causing hyperthyroidism. After pregnancy, some women – up to 8% - may develop a condition called lymphocytic thyroiditis where white blood cells called lymphocytes accumulate in the glandular tissue. Thyroiditis can be diagnosed with blood tests and a thyroid scan. An important component of thyroid hormone is iodine. 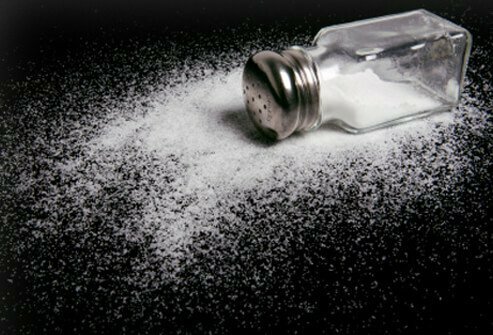 If an excess of iodine is ingested the thyroid may over-produce thyroid hormone and cause hyperthyroidism. 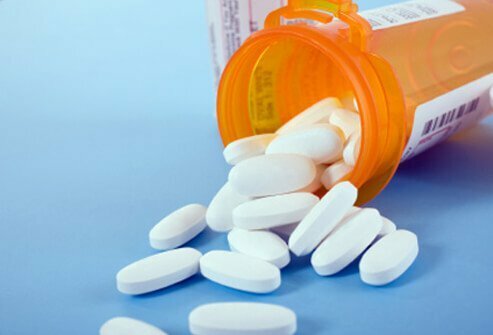 Some medications such as such as the anti-arrhythmic drug amiodarone (Cordarone) contain large amounts of iodine and can induce thyroid dysfunction. When hyperthyroidism is mild, patients may not experience any symptoms. This may also occur in patients age 70 years and older. 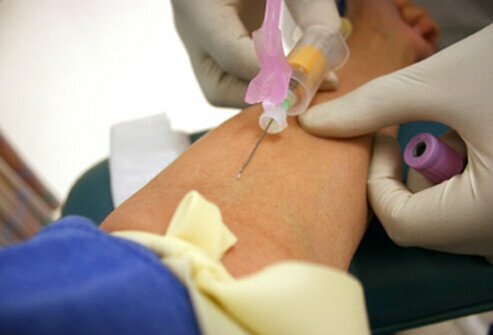 If hyperthyroidism is suspected, diagnosis is made through a blood test to measure TSH levels in the blood. 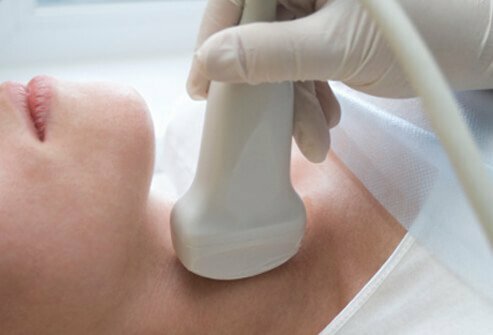 To further delineate what the specific cause of the hyperthyroidism would be, tests such as antibody screenings, nuclear thyroid scans, and the use of radioactively labeled iodine can help pinpoint the cause. Testing of the hypothalamus and pituitary may also be necessary. There are several treatment options for hyperthyroidism. 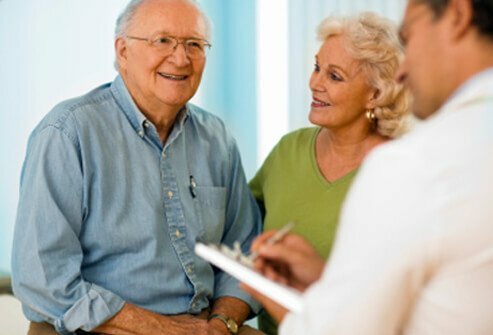 Treatment depends on the patient's overall health, and whether the condition is mild or severe. Treatment may be targeted at managing the individual symptoms, use of anti-thyroid medications, radioactive iodine, or surgery in some cases. One of the main symptoms of hyperthyroidism is a rapid heartbeat (tachycardia). The feeling of a racing heart and/or palpitations can be distressing to patients. The main treatment for this symptom is the use of a beta-blocker. Beta-blockers are a type of blood pressure medication that slows the heart rate. It does not affect the level of thyroid hormone in the blood. Examples of beta-blockers include propranolol (Inderal), atenolol (Tenormin), and metoprolol (Lopressor). Another type of medication used to treat hyperthyroidism is antithyroid drugs. These drugs such as methimazole (Tapazole) and propylthiouracil (PTU) block the production of thyroid hormone in the gland itself. Propylthiouracil (PTU) also blocks a biochemical conversion of T4 hormone to the more active T3 hormone thereby lessening the symptoms of hyperthyroidism. A risk of taking these medications is suppression of bone marrow (agranulocytosis). Bone marrow is responsible for making white blood cells in the body. White blood cells are the body's defense force to fight off infection. If bone marrow is suppressed it may impair the ability to fight infections. 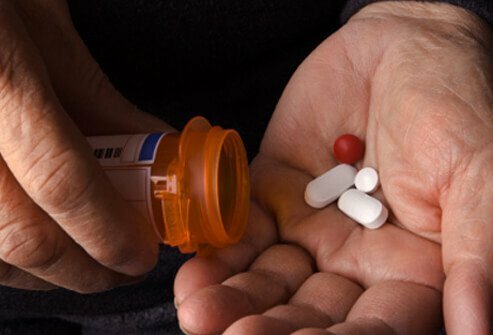 If there are signs of infection while taking antithyroid medications, contact your doctor immediately. If the thyroid gland is overactive and producing too much thyroid hormone, treatment with radioactive iodine (ablative therapy) may be indicated. 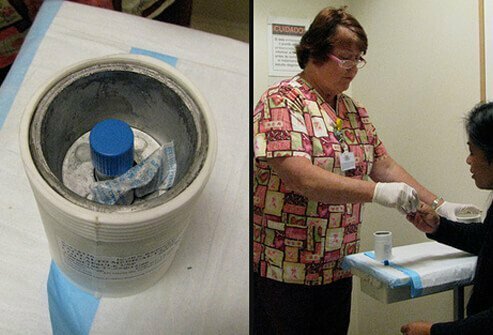 Radioactive iodine is given by mouth on a one-dose regimen. The thyroid gland needs iodine to produce thyroid hormone. The radioactive iodine is taken into the thyroid cells and destroys them. The radioactive iodine is only effective on thyroid tissue and leaves the other body tissues intact. 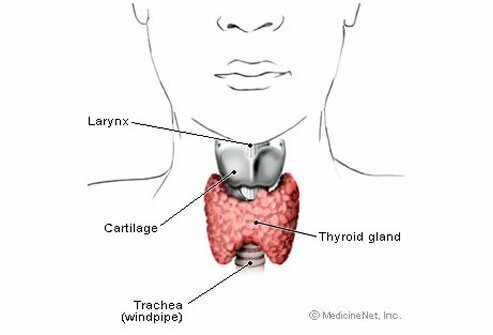 Once the thyroid is destroyed by the radioactive iodine the patient will be on thyroid hormone replacement treatment for the rest of their lives. The use of medications and radioactive iodine has made surgery for hyperthyroidism much less common. Surgery involves removing diseased parts of the thyroid gland through an open incision in the neck. Complications of thyroid surgery may include damage to the nerves that supply the vocal cords, infection, and damage to the parathyroid glands (four tiny glands in the thyroid tissue that regulate calcium levels in the body). 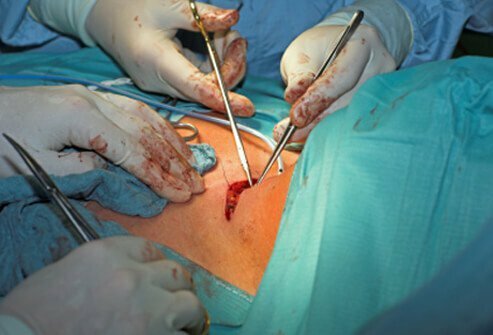 If a total thyroidectomy is performed all of the thyroid tissue is removed and the patient will need to be maintained on thyroid replacement therapy for the rest of their life. Talk to your doctor if you think you have symptoms of hyperthyroidism. Your doctor may perform blood tests or order an ultrasound of your thyroid to diagnose the condition. 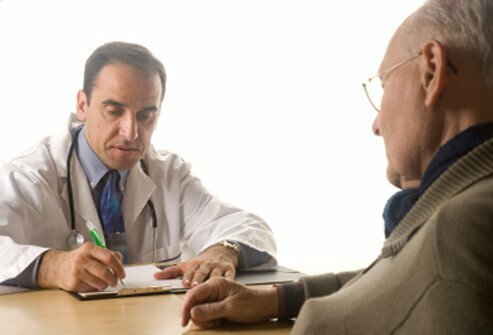 Your doctor may send you to an endocrinologist (a physician who specializes in the function of the glands of the body) for further diagnostic testing or treatment. Most cases of thyroid disease and hyperthyroidism can be easily diagnosed and treated. UpToDate: "Overview of the Clinical Manifestations of Hyperthyroidism in Adults." UpToDate: "Patient Information: Hyperthyroidism (Overactive Thyroid) (The Basics)."